It was pretty icy here in Williamsburg yesterday with big wintry temperatures all throughout Virginia (it's about time, I say! ), so today's feature is about the best winter wedding ideas around the web from some of our favorite wedding blogs. From DIY to real weddings to delicious treats, there's a little of everything to help you plan your winter wedding. Grab a cozy blanket and put on your fluffy socks as you peruse the pretties. 1. One of our most popular winter wedding features was this magical winter wonderland wedding here on Tidewater and Tulle. It's ice, ice, baby and the quintessential chilly-inspired celebration! 2. This dreamy winter solstice inspiration board on Hey Wedding Lady will make you want to find all the candles and romantic fabrics with its mystical moodiness. 3. We are pretty sure these DIY knitted ring pillows on Martha Stewart Weddings are the cutest thing since heart-shaped marshmallows in your hot cocoa. 4. If you're a Christmas bride like I was, you're going to swoon over this country Christmas wedding inspiration on The Bride Link. Especially that cozy winter gingham bowtie the groom wears! 5. Top hats, fur bridal stole and sweater, and a Bailey's Beverage Bar? Yes, please! This real winter wedding on Kiss my Tulle is fabulous! 6. It's not winter without steamy mugs of deliciousness, and My Hotel Wedding has the best winter wedding cocktail ideas! 7. Bridal knitted mittens with hearts on them. Enough said. Head over to Mountainside Bride to see this one! 8. Get ready to have extreme wanderlust because this feature of winter wedding portraits in a castle in Hungary on Fly Away Bride will make your heart swoon… especially when you see this couple's snow cake! 9. These wintry squash dishes on Swooned are the perfect inspiration for any catered wedding reception. 10. 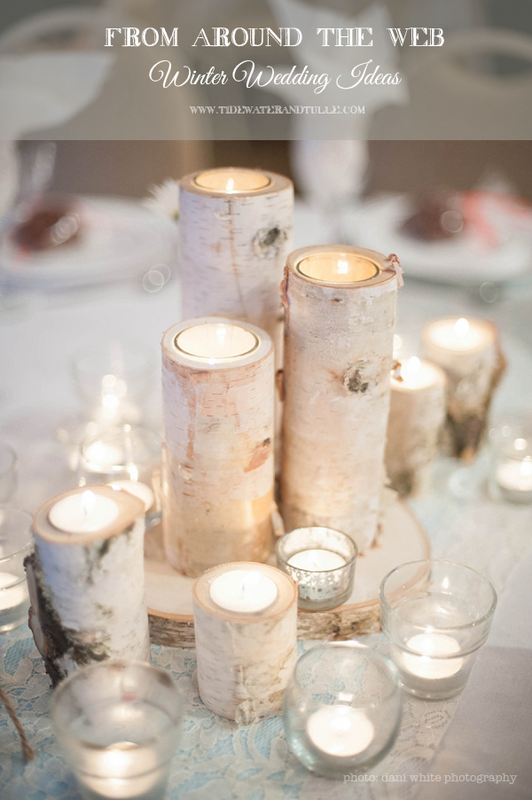 Looking for a great, eco-friendly winter wedding favor idea? We love this DIY pinecone fire starters tutorial on Something Turquoise! "You warm our hearts" is pretty much the cutest phrase for any chilly day! Have something in the wintry spirit to share ? Post below in a comment! Photo by Dani White Photography. For the entire real winter wedding feature and vendor credits, head over to the full feature.